Clark Jacobs and his mom, Mariellen (founders of RAD) are going to have a booth at the Resource Fair for eleven Freshman Orientations on Georgia Tech’s campus this summer. It’s all part of FASET (Familiarization and Adaptation to the Surroundings and Environs of Tech), designed to spread awareness to incoming students of the dangers involved in sleeping in an elevated bed. Currently, Georgia Tech is already considering making the move to have rails installed on all bunk and loft beds. 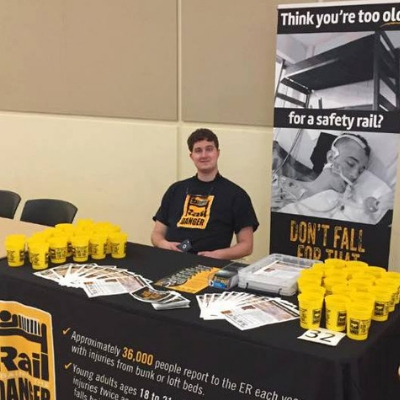 This would require the student to sign a waiver (that includes safety information about falls) to remove the rail from his/her bed.